The 20/20 Trust Digital Technologies (ICT) in Schools Reports present findings and information from surveys coordinated by the Trust. They includes results of developments into future-focused learning, school ICT infrastructure, the use of networks, software, teaching applications, internet access and usage, ICT planning and funding, E-learning developments, professional development, and use of social software. The survey has been carried out every two or three years since 1993, and provides a trusted information base for policy development by the Ministry of Education as well as a useful benchmark for individual schools. 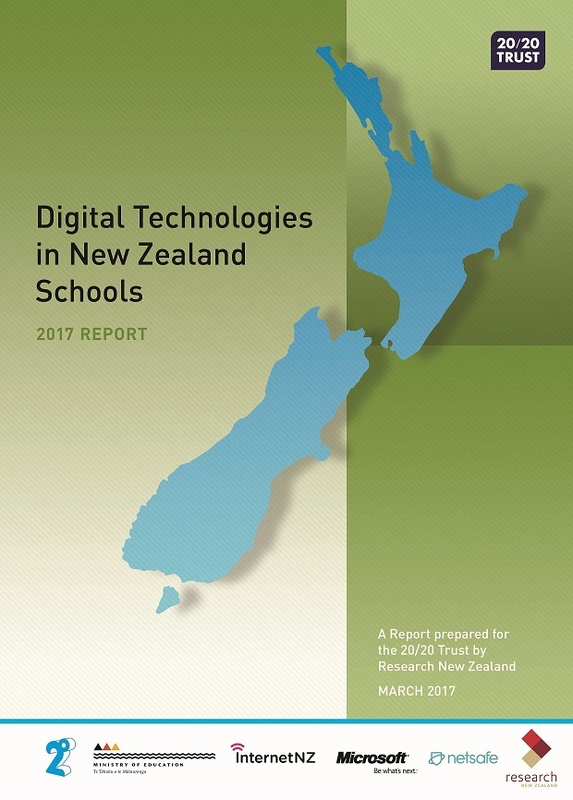 Eight-in-ten principals report that digital technologies are having a positive impact on student achievement, according to the 2016/17 ‘Digital Technologies in Schools’ survey, prepared by Research New Zealand for the 20/20 Trust. The survey was shorter and simpler than the 2014 survey and it was again open to all New Zealand schools. A total of 464 schools completed the survey. As in the last survey, source data files will be made available here for download to allow further analysis. Full 2014 report: Digital Technologies in School 2014 (PDF). There are four data sets: two each for the principals and equipment data sets (a numeric version of each and a version that has the text labels of categorical responses). The data dictionaries are intended to assist anyone wanting to convert the numeric data sets into a SPSS, SAS or Statistica format, as well as provide unweighted frequency counts so researchers can check their conversions. Researchers should use the weight variables to make any analysis comparable with the results in the published report and to adjust for the number of primary and secondary schools in New Zealand.